This week's Tuesdays with Dorie treat couldn't be simpler. Leslie (she's wonderful, you should check out her blog) chose a simple apple tart made with puff pastry. If you use an apple peeler and corer, it should take less than ten minutes to assemble the whole thing. Then people will ooh and ahh because it's so delicious and you'll have to confess that it's simpler than any cookie recipe. I like to keep a box of puff pastry in my freezer for "emergencies". Usually I save the second sheet but this time I made ham and cheese turn overs for my brother. He was so excited that I will have to make them (and this tart of course) again soon. Come back later to see Baby Strawberry's birthday festivities. I baked up a storm and she loved it! Your tarte came out looking so pretty. I also love the glass plate you put it on. Ever since I have been doing TWD, I always keep a box of puff pastry in my freezer. I love how you did the apples. I love apple tarts, and using puff pastry makes it so easy. Can't wait to try this recipe! I can never save the second sheet of puff pastry, which is why I don't keep it in the house! 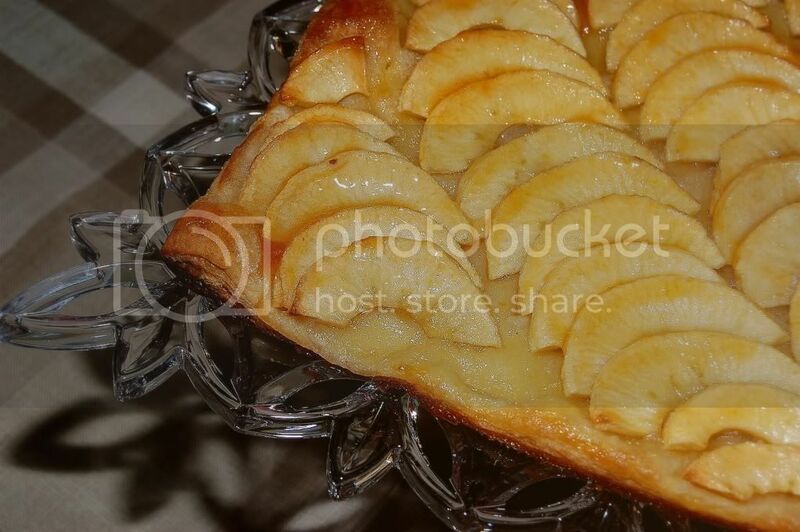 Your tart looks great--I like the diagonal apples. Very elegant looking, as always. I love the ease of puff pastry, don't you? I love the way you arranged your apples! You know I'm a big fan of yours (especially since you're the person who opened up the world of yeast baking for me). I can't wait to see the pictures from Baby Strawberry's birthday! Thanks for baking with me this week! I have made something similar to this...love it! Your tarte is beautiful. I like the ham and cheese idea! Love your serving dish! Great job as always! I really need to keep puff pastry on hand, too. Fine looking tart! Your picture is pretty, love the dish it's in!! Are you saying your baby is 1? Can't believe that. Loved this tart. Yours looks great! What a gorgeous tart - perfect use of that emergency puff pastry (which I also keep on hand). Happy birthday to the baby - didn't that year go fast?